Amity Manning and Conor Herlihy, a PhD candidate in biology and biotechnology, review images of cells undergoing division in the absence of the protein pRB, which appears to play a critical role in chromosome segregation. Amity Manning, assistant professor of biology and biotechnology, has received a three-year, $300,000 award from the Smith Family Awards Program for Excellence in Biomedical Research. 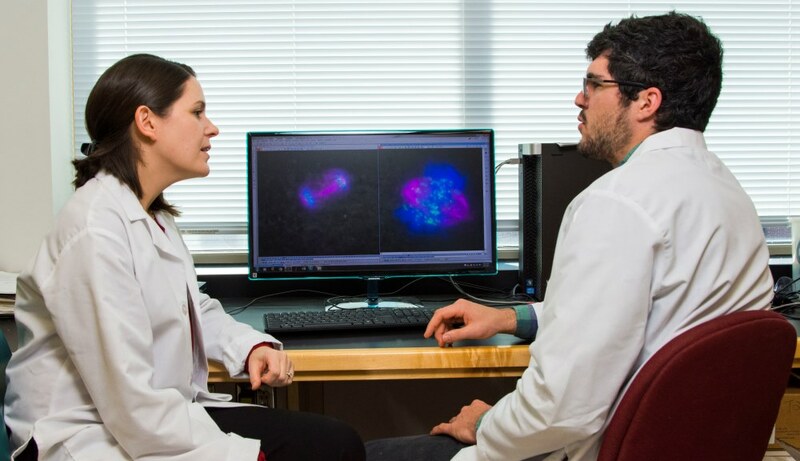 The grant will support her research on the molecular biology of cancer cells, work that may lead to a better understanding of how tumors evolve and how some become resistant to chemotherapy drugs—knowledge that could pave the way for new kinds of anti-cancer medications. newly independent faculty members in Massachusetts whose research focuses on biomedicine, with the aim of achieving medical breakthroughs in such areas as cancer, heart disease, diabetes, and neuroscience. Manning is one of just six recipients of the prestigious award this year. In her research, Manning explores the biology of cancer cells, looking in particular at molecules that help regulate changes in the genome, or genetic material, within these cells. It is known that certain mutations and other defects in the genome are responsible for the uncontrolled cell division that occurs in cancer, for the ability of tumors to adapt to changes in their environment and to metastasize, and for the resistance that some cancers develop to anti-cancer medications. But there are a host of unanswered question about how those genetic changes occur and the effect they have on cancer cells. Manning’s current focus is a molecule known as retinoblastoma protein, or pRB. In normal tissue, pRB helps determine when cells can divide. In tumor cells, the protein is either defective or not present, which leads to uncontrolled cell division. In previous work, funded by the National Institutes of Health, Manning and her research team showed that pRB also plays a role in assuring that the chromosomes are correctly segregated when a cell divides. During normal cell division, or mitosis, a human cell’s 46 chromosomes are first duplicated, then the pairs of duplicates line up in the center of the cell. Thin fibers called microtubules emerge from structures known as centromeres and pull the duplicate sets of chromosomes apart so two new “daughter” cells, each with an identical set of chromosomes, can be formed. In the absence of normally functioning pRB, the segregation process goes awry. As a result, the daughter cells can end up with the wrong number of chromosomes (known as aneuploidy). In her research, Manning has found that the absence of pRB is associated with defects in chromatin, the complex of proteins and genetic material that make up chromosomes. These defects may alter the way microtubules latch onto and move the chromosomes. Errors in chromosome segregation, known as chromosome instability, are associated with genetic differences that are seen between tumors of the same type, and even between cells within the same tumor. They may also contribute to the increasing number of mutations that can occur as a tumor grows. The resulting genetic heterogeneity is believed to account for the fact that a tumor that responds well to chemotherapy may later become resistant to the anticancer drugs. Manning said she believes her research will show that pRB plays a multifaceted role in regulating chromosome segregation, one that likely involves recruiting proteins that regulate the organization of DNA. Changes in the activity of such regulators are known as epigenetic changes; they can impact what genes are expressed and how chromatin behaves, without altering the DNA sequences. “We believe that pRB functions as a sort of scaffold,” Manning said. “It brings the other regulators to the genome and those regulators determine how the chromatin of organized. So when pRB is not there, those regulators are not recruited the way they should be.